Montserrat used to be an idyllic tropical island where famous bands used to come and record famous albums in Sir George Martin’s famous Air Studios. Maybe Jimmy Buffett knew something when he recorded Volcano about the then dormant Soufrière Hills volcano on the island. The volcano did blow and nowadays the southern part of the island is deserted – and it’s where most of the people used to live and work. So with Barry and Ramona on board, we set off for Montserrat, 26nm away. It was another nice broad reach doing 8s and 9s under a single reef. We arrived at 1.30pm to find one engine alarming with the water intake light. So we anchored quickly on one engine and I headed in to check in. There’s an online check-in facility called Sailclear that makes life easier – except when you have people leaving the boat in Montserrat. It took me two return trips back to the boat to complete the process. Finally at 4pm, we were able to walk out the gate and off to the bar. Check in finally completed, we headed for the bar to give the skipper a well deserved drink. Little Bay isn’t much of a town, just a port. We wandered further afield and found a T20 cricket game happening between all the expats that had returned for the festivities and the locals who had stayed on after the eruptions. It was interesting to see people from Boston playing cricket. Next day, we hooked up with Joe and did a tour of the island. Wayne and Ali from Blue Heeler also joined us and we headed firstly to the Volcano Observatory where all the scientists work. We saw a great short film on the volcano and the devastation it caused. Joe himself lost his house in the eruptions and had to start again. A lot of residents took advantage of an offer to relocate to the UK. The highlight of the tour for me was visiting the now disused Air Studios, set up by Sir George Martin in the mid 70s. Elton John recorded three albums at the Montserrat studio in the 1980s. Dire Straits recorded their successful Brothers in Arms album between 1984 and 1985. Other artists such as Ultravox, Paul McCartney, The Police (Ghost in the Machine and Synchronicity), Rolling Stones, Pink Floyd, Black Sabbath, Little River Band, Duran Duran, Sheena Easton and Supertramp have also recorded albums there. In 1989, Hurricane Hugo devastated the island and the Montserrat facility was severely damaged and thus forced to close. We were able to clamber up a wall through a hole in the fence and have a good sticky beak at a piece of music history. Next day we lucked on St Patrick’s Day in Montserrat. 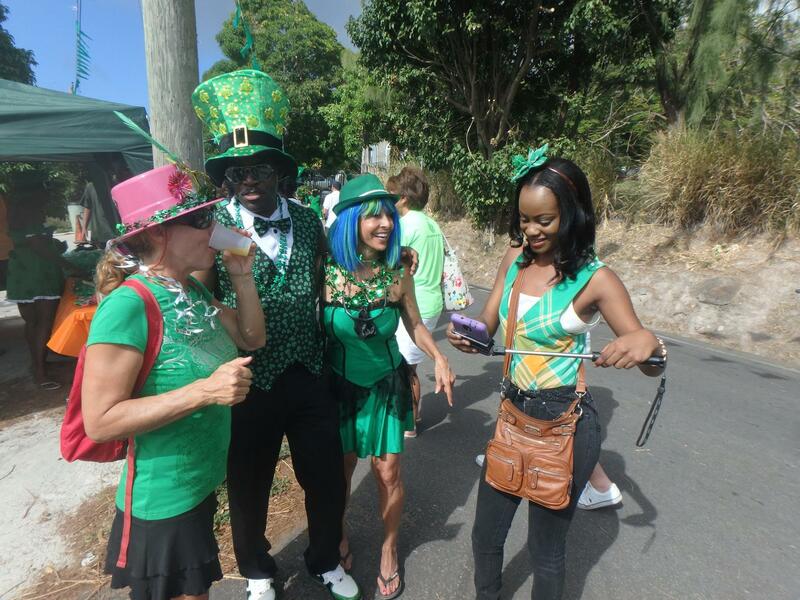 It’s a big thing here and through no planning Montserrat’s Irish heritage dates back to the late seventeenth and early eighteenth centuries. The island’s first generations of European settlers were predominantly Irish, forced out by religious persecution by Oliver Cromwell and his henchmen. Since then, the sugar industry started up bringing an influx of African slaves, who In 1768, rebelled again their inhumane treatment. The revolt took place on St Patrick’s Day. It failed, but the association lingered – a cry for freedom. 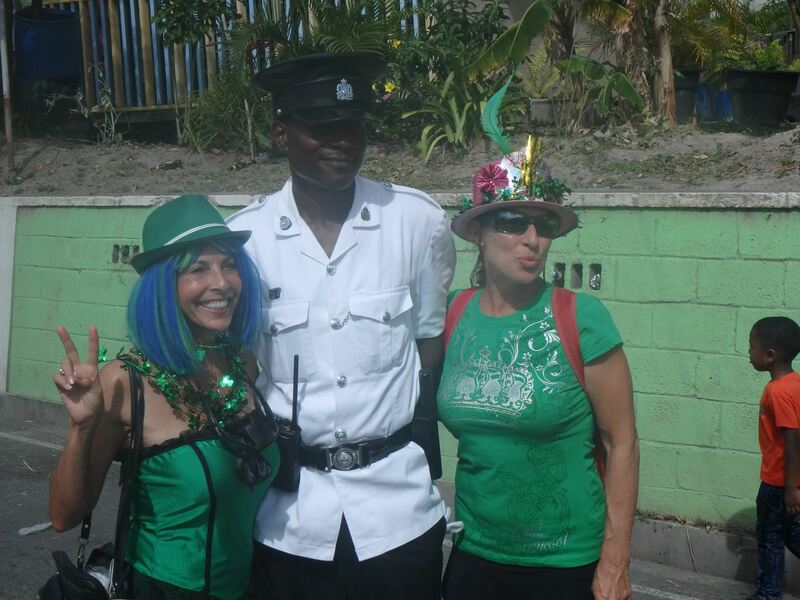 So here in Montserrat, St Patrick’s Day has a dual purpose in celebrating the freedom both the Irish and African heritage craved. 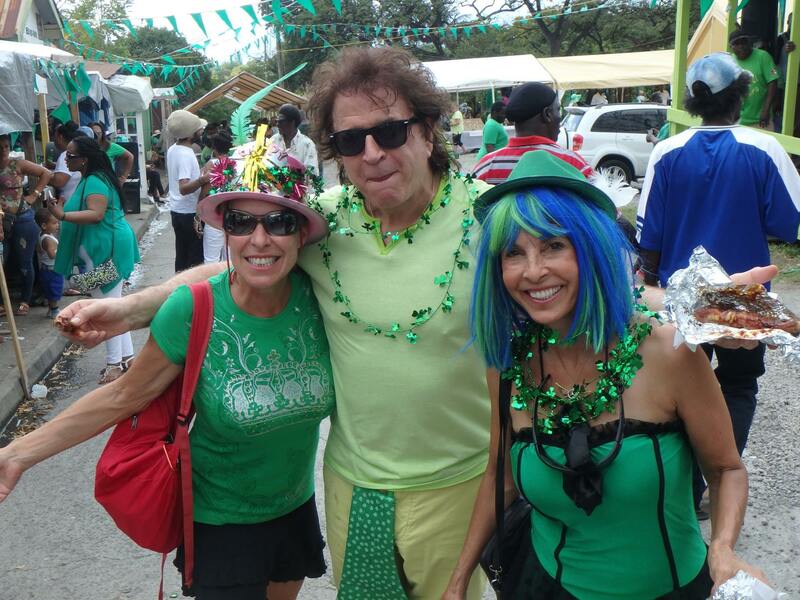 This legacy of St Patrick’s Day has carried through to present day where St Patrick’s Day became an .officially designated national holiday in 1985. 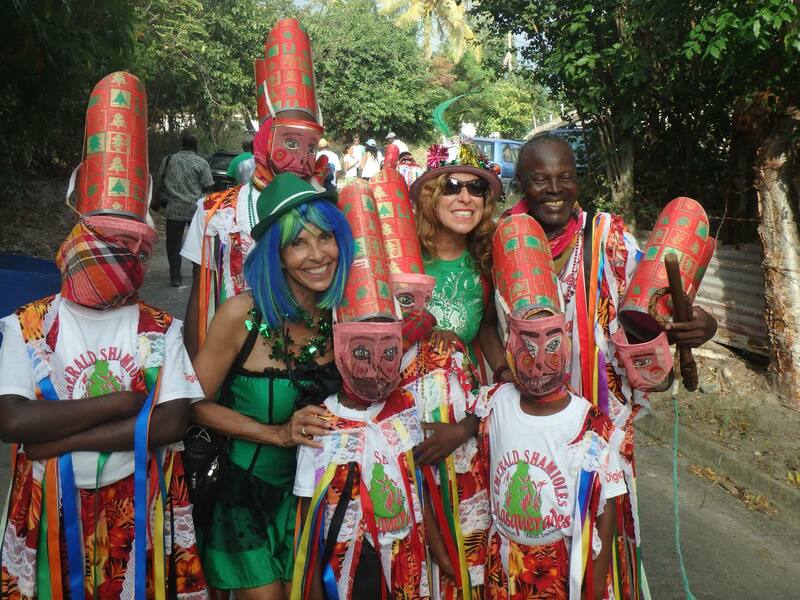 The whole week is one long celebration with many Montserratians that live abroad in NY, Boston and London returning to party. The place to be for the day was Salem where they had a big parade. Salem gets the gig because its the closest habitable village to the parish of St Patricks, which is in the exclusion zone these days. After a great tour of the Island and a day spent at St Paddy’s celebrations we still had a few days to kill so we motored south to have a closer look at the devastation of Portsmouth from the sea. We nearly made it before the fumes and the threat of ash that was blowing out over the sea got us to turn back. We anchored for the night at Old Road Bay, technically in the danger zone but only when the volcano is active. It was a lovely anchorage except for the surf beach which we decided was not for our dinghy. Dee and I snorkelled in and checked out the very nice bar with live music that night. Shame we couldn’t get in. Next day it was back to Little Bay to do a bit of snorkelling before a quick last meal with Ramona and Barry before we waved them goodbye as they caught the ferry back to Antigua. Next morning we headed North West to Nevis.